Organic oxalic acid occurs naturally in varying degrees in plants and animals, and is an important element, even essential, to maintain and to stimulate peristaltic motion in the body. It is made by the human body from other substances such as vitamin C. It can also be ingested from food and readily combines with calcium which is why some people have concern. 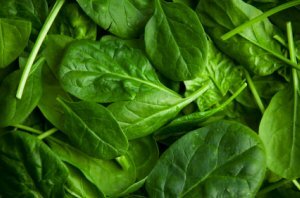 Dr Fred Bisci has writen that he thinks spinach should be eaten raw because of its ability to stimulate peristaltic motion, that is to move the digestive tract. Research and beliefs amongst much of the raw food community suggests that when both oxalic acid and calcium are organic the result is beneficial with oxalates helping the digestion and assimilation of the calcium. It’s believed that only when the oxalates become inorganic because it was cooked or processed, that it forms an interlocking compound with the calcium that destroys the nutritional value of both and becomes harmful. For this reason, when you drink fresh raw spinach juice; your body utilizes 100% of all the minerals that spinach has to offer. But when cooked, the oxalic acid in spinach becomes inorganic and may create health problems long term. When the concentration of inorganic oxalates are high, it may precipitate out in crystalline form bound with the calcium. These tiny crystals can irritate the human tissues, and get lodged in the stomach, kidneys and bladder as "stones". Another body of research shows that oxalic acid binds with the calcium in the food and makes it unavailable for assimilation and use by the body. And when foods are cooked, at least some of the oxalates are destroyed, although once again there go many of the nutrients as well. It is the position of the USDA, and a number of other researchers, that only the calcium in the same plant that contains the oxalic acid is bound and not available, perhaps the way nature intended. So calcium from another source at the same meal will not be affected. So no matter which train of thought is most accurate, for me it comes back to balance and variety. For most people on a balanced diet, eating a wide variety of foods, oxalates will have no appreciable effect on health or longevity. However, for people with kidney stones, gall stones or severe calcium deficiency problems it's intake should be restricted. Below is a list of selected foods with high oxalate content, greater than 10mg per serving. Please take this as a guide only as the content level may differ depending on climate, location, soil quality, degree of ripeness when tested, and which part of the plant was analyzed. The vegetables that people typically have problems with are Swiss chard, beet greens, spinach, and rhubarb. The contents of this website and my newsletter are gleaned from my experiences and observations, meant only for educational purposes and not intended to replace medical advice, consultations, or treatment of any kind. I recommend you see your professional health care provider if you suspect you have an illness or disease of any kind. I’m not medically trained, and I would never suggest or imply that I know what is best for someone else’s body or overall health, ultimately each of us is the only one who knows what’s best for us.